Peace comes to me most in those evenings when my husband is traveling and the kids are all fast asleep in their beds. Is that bad of me? It's not to say that I don't love my family with every ounce of my being. But, peace? That comes with quiet solitude. And, lately, it even comes early in the morning, when it's still dark outside. That's usually when Little S wakes up and screams her presence to the rest of us. I leap from the warm comfort of my bed to the side of hers as fast as Santa's reindeer on the rooftops to avoid any other little footprints coming wandering down the hall. Then, Little S and I return to slumber in Daddy's leather chair. Which sits in front of our fireplace. That we just last week turned into gas logs. And every morning. S and I find peace. She's so funny. 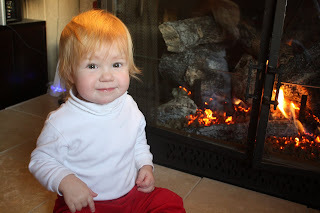 Now when we sit together in that comfy chair, she points towards the fireplace and says, "ah!" Which means, of course, "turn that baby on and let's snuggle, Mom." It is new every morning.